Ubuntu-powered Tablet Computers: Will they work or won’t they? With the iPad, Apple started a new revolution in the world of technology. Swarms of Apple-fans and tech enthusiasts ran to the Apple store just to grab, what was then, simply a bigger version of the iPhone. While the iPad may have been a big success worldwide, it has undoubtedly touted its competitors to come up with tablet computers of their own. Although essentially every other software company (except Microsoft of course) has been relying on the good old Android, there have been some whispers about the porting of Ubuntu to these sleek gadgets. What’s more, a Chinese company is already working on a fully functional Ubuntu-powered tablet computer. It was when GizChina reported about an upcoming Ubuntu-based tablet that Ubuntu users worldwide rejoiced at the sight of their favorite Linux distribution entering a new market so quickly. The tablet itself is quite good in terms of hardware specifications and is very much on the competitive side. The big thing to watch out for though is that whether Ubuntu will actually work well on these devices. Now don’t get me wrong here friends, when I said, “work well” I mean anything that would please the most nontechnical and laziest user around. One reason why the iPad has been so successful is due to the fact that its operating system (iOS) has one of the most easy-to-use user interfaces ever designed. So, no matter how great the hardware maybe, the operating system still matters a lot. If Ubuntu wants to enter this market, it has to work hard on the UI area so that it feels just as good on a tablet as it feels on a desktop. Here are some of the reasons that may make Ubuntu popular on tablets and some reasons it won’t. Ubuntu’s interface is a blend of two of the most popular desktops around. Windows or Mac users who’ve used Ubuntu usually experience a level of familiarity that makes their switch easier. While with the recent Ubuntu versions, the element of familiarity might have shifted more towards Mac than Windows, it’s nevertheless a great thing to have. Having a tablet that behaves more like a desktop might actually be quite appealing to a whole new userbase. Of course, with the newer versions like Natty and Oneiric, Ubuntu has made its UI more suited for mobile devices making it a good contender for tablets too. Maybe I couldn’t think of a more obvious reason but having something that’s free is a great thing for both consumers and manufacturers. Ubuntu being free can be installed on any tablet device, including Galaxy Tab (see video) thus making it a great OS for small-time manufacturers who are waiting eagerly to break in to the tablet market. With little tweaks, indie companies could sell completely functional tablet computers to millions of Linux users worldwide. Apple has been chasing Google with a knife since they first heard about Galaxy Tab. One of the reasons Apple sued them is because they think that Android copied iOS’s patented UI. Of course, with Ubuntu, that won’t be a big problem since Ubuntu has a completely unique and open UI, which so far hasn’t managed to violate any patents. Having an Ubuntu-powered tablet will save a small-time gadget manufacturer a million-dollar lawsuit and the trouble of visiting court every day. As contentious Ubuntu’s new Unity UI may be, it has definitely managed to strike a chord amongst users who were looking for a more unified interface that would work across all devices. As Unity keeps maturing, it will certainly be great to have one user interface across all devices. To add to the fun, Ubuntu already has built-in syncing capabilities that would make things easier for users who own multiple devices. One can only imagine how great it would feel having the same interface across all devices you own. Go out on the street, find a random person and ask him/her if they’ve ever heard of Ubuntu. Chances are, 95% of the time their response will be negative. Even though we are very much aware how powerful Linux is, the average user is wary of trusting anything that’s new. Adding to that, the belief that ‘Linux is for geeks’ is still dogmatically widespread amongst the technical users and non-technical ones alike. Even though it might seem quite tempting to own an Ubuntu-powered tablet, the lack of apps will surely be one of the biggest issues. Both Android and iOS, have millions of apps which is completely different market in itself. These apps let the users add to existing functionality of the operating system making the user experience even more engaging. For Ubuntu, as of now, the lack of quality apps doesn’t make it as enviable as an iPad or a Galaxy Tab. Ubuntu, if at all ever decides to enter the tablet market, will face the same problems it has faced on the desktop front. The lack of manufacturers who are ready to invest in a tablet that’s powered by Ubuntu is not that hard to predict. Maybe Dell can make an investment on this front, but the chances are slim. What do you think of Ubuntu running on tablets? Will it work? Will it fail? Just let us know what you think using the comments section below. I think Ubuntu won’t target Tablets anytime soon. The main reason is that standard desktop applications simply aren’t tailored towards touch. The desktop may be nice, but you probably wouldn’t want to use Firefox, Thunderbird or Gwibber with your fingers. Not to mention the still missing super-sleek touch keyboard (GNOME 3 gets a nice one, but Ubuntu’s still lacking here). Nevertheless, Ubuntu might come on tablets. 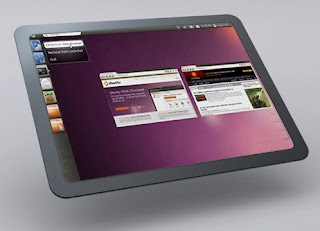 First, some power users are already experimenting with Ubuntu on several devices. Second, manufacturers might choose Ubuntu as a basis for their tablets. If they to it badly, Ubuntu’s good name might suffer. If they do it right, they take Ubuntu Core as a basis for a touch-centric custom UI. I think the latter is the way Canonical would thinks want to be.